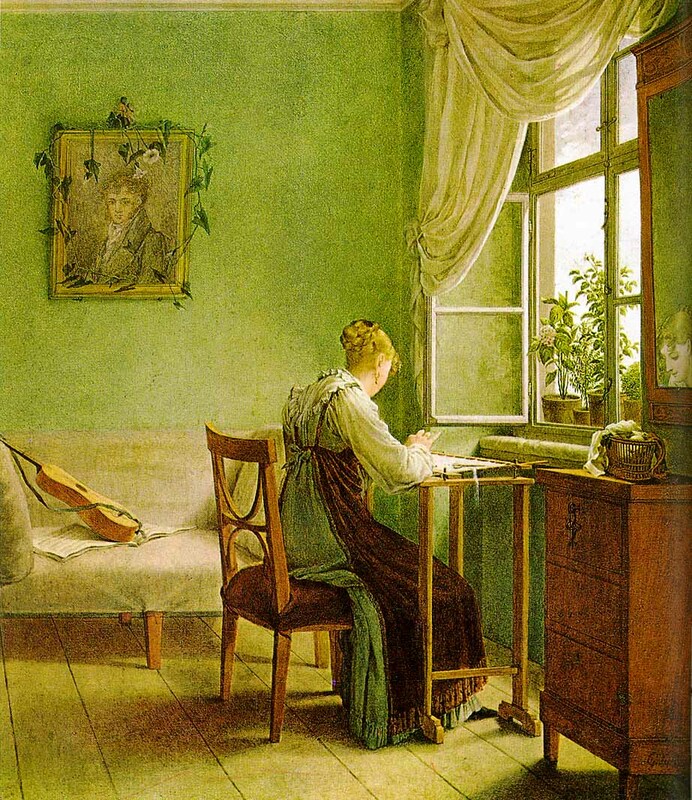 Wallpaper made with Scheele’s green was deadly, By 1830, wallpaper production had risen to 1 million rolls a year in the UK, and by 30 million in 1870. Tests later revealed that four out of five wallpapers contained arsenic. Leopold Gmelin (1788-1853), a famous German chemist, suspected as early as 1815 that wallpaper could poison the atmosphere. He noticed that the substance gave off a mouse-like odor when the paper was slightly damp. Gmelin warned people to strip their rooms of the paper and advocated banning Scheele’s green, but he was too far ahead of his time. Soon arsenic was exported for the making of pesticides in the United States. Health considerations did not end the use of arsenic-laced wallpaper. 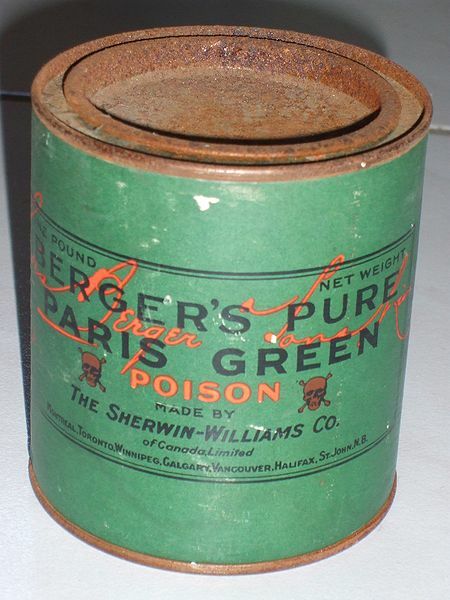 By the 1870’s synthetic green dyes began to replace arsenic, and fewer people were placed in danger by its poisonous gases. Experiments at the end of the 19th century proved that arsenic pigments in damp or rotting wallpaper were lethal. The mold that grew on damp wallpaper emitted a toxic odor that smelled of garlic. The French painter Cezanne had an affinity for using paris green, and it might have been no coincidence that he suffered from severe diabetes. The pigment had a tendency to turn black when exposed to heat and thus it did not become universally popular with artists. Even with scientific evidence of its highly toxic nature, production of emerald green paint was not banned until the 1960’s. Great post and Wow, very interesting about the French not wanting to do the green costumes! 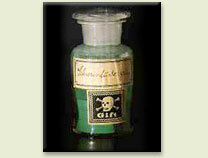 on March 5, 2010 at 14:12 Chris S.
They knew it was poison so they changed the label and kept on making it. Well, that’s a long standing tradition then! One would think if several children died after eating those leaves, there would be an investigation, but I guess there was no Regency CSI then. Fascinating post. Would make for a great Regency murder mystery. I always wondered about this–I thought the color might have been evocative of envy. I’m glad to know there’s a better reason! Thanks for in interesting and informative post! What a fascinating post! Isn’t it interesting that it’s used to make brilliant green dyes, but that it neutralizes the green tint iron gives glass? That was a badly written sentence. Actually, the addition of the arsenic tints the glass green. I’ve rewritten the passage. Wonderful post! I’m passing it on to some history museum friends…. Thank you for this most interesting post… Just one thing about the French avoiding green theater costumes: it is a superstition that can actually be traced back to the XVIIth century. Indeed, tradition has it that the famous French playwright and actor Molière (1622-1673) died on stage wearing a green costume during a performance of Le Malade imaginaire (The Imaginary invalid). If truth be told, he died a few hours after the performance and it had nothing to do with his wearing a green costume (he had been suffering from tuberculosis for quite a long time, note the irony for someone who played an “imaginary invalid”). Best regards from Paris. Thank you so much for your clarification! I love superstitions, most of which are based on fact. I placed an asterix next to my comment in the post, for the statement in Wikipedia was unsourced. This was a fascinating article. No wonder they have so many safeguards today. I have just been stripping wallpaper in my circa 1860 house. The bottom layer (of about nine) was a very pretty shade of green. Now that I am looking it up, I am wondering if I have just signed my own death warrant.